Adhesive residue remover with active ingredients. Use it to remove fresh or old glue residues, generated from any kind of adhesive tape removal. Easily removes adhesive residues from PVC tapes, masking tapes and even polyester films that protect the edges of plastic tubs and stainless steel sinks, bathroom sinks, as well as porcelain basins. Easily remove residues from aluminum, PVC or wood frames and doors. Recommended for cleaning any object that has attached on it labeling stickers or safety tapes. 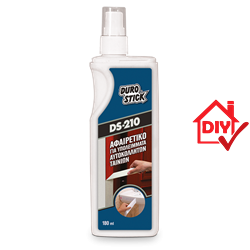 It is ideal for removing adhesive residues left from masking tapes that were applied before painting.